Belkin's new N900 is a new Wi-Fi router with that will help you prioritize high-bandwidth activities like games. The company also announced an advanced dock that works with Intel’s high-speed Thunderbolt port. 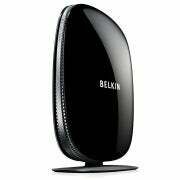 The new Belkin N900 DB Router is a dual band Wi-Fi device capable of speeds of 450Mbps per band. In addition to standard features like 802.11 b,g and n support, four ethernet ports and two USB 2.0 ports for connected storage, the N900’s big selling point is its use of Belkin’s IntelliStream technology. Belkin promises that IntelliStream will help the N900 prioritize high-bandwidth activities like games and video so that your Netflix stream isn’t interrupted when (just as a crazy example I’ve never experienced) your roommate comes home and decides to video chat with her family. In addition to the new router Belkin also announced new details about its Thunderbolt Express Dock. The dock is meant to provide be a helpful desktop hub for Apple’s Macbook Air and other Ultrabooks that use the new Thunderbolt standard but are, generally, pretty light on other ports. The $299 Thunderbolt Express Dock will include three USB 2.0 ports, one Firewire 800 port, one HDMI port, one 3.5mm Audio port, one gigabit Ethernet port, and two Thunderbolt ports and will be released in September. All those non-Thunderbolt ports are probably a good addition since the Thunderbolt technology has yet to see many peripherals that really take advantage of it. But who knows? Maybe we’ll see more as CES progresses.